]]>http://sheikhnazimalhaqqani.com/en/Announcements/16193/communist-china-is-spreading-terrorhttp://sheikhnazimalhaqqani.com/en/Announcements/16193/communist-china-is-spreading-terrorWed, 05 Aug 2009 15:10:01 +0300China must end its genocide of muslim Uyghur Turks and declare the whereabouts of the Uyghur Turks who have been forcbly taken awayThe time has come for China to stop shedding blood. It is unworthy of China to constantly shed blood, ruthlessly oppressing people in the enforcement of violence and repression. IT IS A MUST THAT THE TURKISH-ISLAMIC UNION BE FOUNDED AT THE SOONEST TIME IN SO THAT THIS, THE WORST GENOCIDE IN THE HISTORY OF THE WORLD, CAN BE BROUGHT TO AN END AND FOR ALL FORMS OF OPPRESSION ACROSS THE WORLD TO CEASE. The states of the world must unite against this oppression, and international law must be enforced immediately. ]]>http://sheikhnazimalhaqqani.com/en/Announcements/15539/the-turkish-islamic-union-ishttp://sheikhnazimalhaqqani.com/en/Announcements/15539/the-turkish-islamic-union-isTue, 21 Jul 2009 19:39:24 +0300Only the Turkish-Islamic Union Can Halt the BloodshedThe persecution in East Turkestan over the last week is not the first that our Muslim brothers have been confronted by. Our East Turkestani brothers have been subjected to all kinds of maltreatment for the last 60 years and live under unbelievable repression. Muslims have been slaughtered in Palestine for some half a century. They live the lives of exiles in their own land. Reports of deaths flood in from Iraq on an almost daily basis. Our Kirkuk brothers live in constant fear of death. Muslims in Crimea are trying to survive under the harshest of conditions. The blood of Muslims is shed almost every day in Afghanistan, and thousands of Muslims have become refugees in their own country in Pakistan. Only recently, Bosnian Muslims were subjected to ruthless genocide in the heart of Europe, before the very eyes of the world. Prisons in many countries are full of Muslims arrested because of their ideas and faiths. These sufferings, killing, troubles and woes are nothing new. Muslims have been ruthlessly oppressed for around a century now. 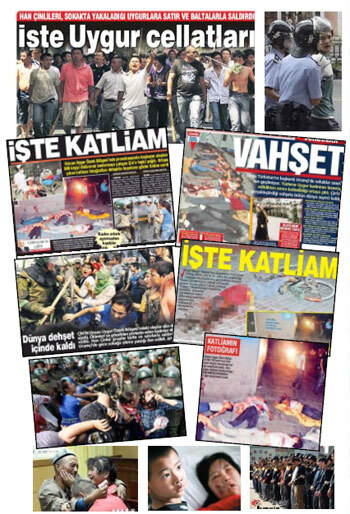 This corruption and bloodshed can be brought to an end only by the establishment of the Turkish-Islamic Union. The Turkish-Islamic Union is the clear and certain solution, the salvation of Palestine, Iraq, Afghanistan, East Turkestan, the Crimea, Kirkuk and Moro. ]]>http://sheikhnazimalhaqqani.com/en/Announcements/14910/the-turkish-islamic-union-ishttp://sheikhnazimalhaqqani.com/en/Announcements/14910/the-turkish-islamic-union-isWed, 01 Jul 2009 11:41:12 +0300The Solution to the Kirkuk Problem is the Turkish-Islamic UnionTurkey has a historic duty to protect an innocent people who share the same origins and beliefs and who speak the same language. The peace and prosperity of our Turkmen brothers is a historic, moral and political responsibility for Turkey. This can be brought about through the establishment of the Turkish-Islamic Union. In order to bring peace to reign in a region experiencing troubles and suffering, steps toward the foundation of the Turkish-Islamic Union must be taken without delay. The Turkish-Islamic Union is also essential and indispensible for the peace, liberation and happiness of all Muslims in Iraq. ]]>http://sheikhnazimalhaqqani.com/en/Announcements/14909/the-solution-to-the-kirkukhttp://sheikhnazimalhaqqani.com/en/Announcements/14909/the-solution-to-the-kirkukWed, 01 Jul 2009 11:31:04 +0300The Communist Threat Must Not Be Underestimated! ]]>http://sheikhnazimalhaqqani.com/en/Announcements/9653/a-statement-to-darwinistshttp://sheikhnazimalhaqqani.com/en/Announcements/9653/a-statement-to-darwinistsFri, 10 Oct 2008 14:15:31 +0300The Turkish-Islamic Union is the Solution to the 'East Turkestan Question' Muslims are living under difficult circumstances in various regions of the world. The people of East Turkestan in the extreme West of China, for instance, have been exposed to severe repression for the last 50 years in particular. Life in East Turkestan, the majority of whose population are Uighurs, is far more troubled than any other region of China. The number of people killed in East Turkestan together with post-1965 massacres is the unbelievable figure of 35 million. ]]>http://sheikhnazimalhaqqani.com/en/Announcements/9606/the-turkish-islamic-union-ishttp://sheikhnazimalhaqqani.com/en/Announcements/9606/the-turkish-islamic-union-isSat, 04 Oct 2008 23:57:47 +0300The Global Darwinist Dictatorship Must Apologize to the Entire World!